A perennial problem for academics is the inevitable loss of information and subtlety that occurs when a source document is translated from [say] ancient Greek into modern English. Sadly, unscrupulous academics have weaponised this Lost in Translation artefact to deliberately obscure, transform or omit inconvenient information. A classic example of this Lost in Academia technique is the the island of Taprobane. Well, then, let us pass on to the country that rises opposite to the Cinnamon-producing Country and lies toward the east on the same parallel. This is the region about Taprobane. We have strong assurance that Taprobane is a large island in the open sea, which lies off India to the south. It stretches lengthwise in the direction of Ethiopia for more than five thousand stadia, as they say ; and from it, they say, much ivory is brought to the markets of India, and also tortoise-shell and other merchandise. The mainstream translation for Taprobane is Sri Lanka aka Ceylon. Taprobana or Taprobane was the name by which the Indian Ocean island of Sri Lanka was known to the ancient Greeks. This translation standard has been operational for at least 359 years [see final map]. Taprobane, Ptolemy the largeft and nobleft ifland in the Indian fea, not inferior to Britain in extent, Strabo ; fituate between the Sinus Colchicus and Argaricus, Ptolemy. Whether a large ifland, or the firft part of another world, as Hipparchus calls it, is a doubt with Mela. But moft writers, prior to him, made no manner of doubt about its being an ifland, as Strabo, Dionyfius Periegetes : and Pliny, though pofterior to Mela, obferves, that Alexander’s expedition confirmed it to be an ifland ; though before that time taken for another world : and under the emperor Caudius, the ambaffadors, who came to Rome from Taprobane, removed every doubt, Pliny. It was alfo called Palaefimundi Injula, and the laft name given it by the ancients was Salice, the people being called Salae, Ptolemy. It is now generally allowed to be the ifland of Ceylon, fituate between feventy-eight and eighty-two degrees of eaft longitude, and between fix and ten degrees of north latitude. Unfortunately, this example of Lost in Academia is demonstrably “preposterous nonsense”. Sri Lanka is a relatively small island that covers about 4º of latitude and 2º of longitude. Whilst Ptolemy’s Taprobane is a large island covering about 15º of latitude and 12º of longitude. Clearly, the mainstream claim that Taprobane is Sri Lanka is preposterous nonsense. That this example of Lost in Academia has remained standing for [at least] 359 years speaks volumes about academia and suggests they’re masking major narrative problems. One obvious area to search for these narrative problems is in any of the Greek peripluses that list the ancient ports and coastal landmarks of India or Taprobane. A periplus is a manuscript document that lists the ports and coastal landmarks, in order and with approximate intervening distances, that the captain of a vessel could expect to find along a shore. It served the same purpose as the later Roman itinerarium of road stops; however, the Greek navigators added various notes, which if they were professional geographers (as many were) became part of their own additions to Greek geography. In that sense the periplus was a type of log. The Periplus of the Greek Scylax of Caryanda has been interpreted as a voyage “down the Ganges” to Taprobane. The Periplus of the Greek Scylax of Caryanda, in Caria, who allegedly sailed down the Indus River and then to Suez on the initiative of Darius I. This voyage is mentioned by Herodotus, and his pleriplus is quoted by Hecataeus of Miletus, Aristotle, Strabo and Avienus. Such, at least, is the prima facie narrative based on Herodotos. Recently, however, Dmitri Panchenko has argued persuasively, on the basis of apparent references to Scylax’s work in the late Greek author Philostratos, that Scylax not only traveled through Pakistan, but in fact also travelled to North India as well, and made his way down the Ganges, and arriving at Taprobane (Sri Lanka). He has also calculated the likely date of Scylax’s departure for India as July 518 BCE. Whilst the 1816 version of a 10th century copy of a supposed 1st century manuscript [first published in 1533] called the Periplus of the Erythraean Sea lists ports in “India as far as the Ganges”. The Periplus of the Erythraean Sea or Red Sea, was written by a Greek of the Hellenistic/Romanized Alexandrian in the first century CE. It provides a shoreline itinerary of the Red (Erythraean) Sea, starting at the port of Berenice. Beyond the Red Sea, the manuscript describes the coast of India as far as the Ganges River and the east coast of Africa (called Azania). The Periplus text derives from a Byzantine 10th-century manuscript in minuscule hand, contained in the collections of the University Library Heidelberg, and a copy of it dating from the 14th or 15th century in the British Museum. The Periplus was edited by Sigmund Gelen (Zikmund Hruby z Jeleni of Prague) and first published in a modern edition by Hieronymus Froben in 1533. This edition was corrupt and full of errors but served for later editions for three centuries until the rediscovery of the 10th century Heidelberg manuscript which was taken to Rome during the Thirty Years War (1618–1648), then to Paris under Napoleon, and finally returned to Heidelberg in 1816. One historical analysis, published by Schoff in 1912, narrowed the date of the text to 60 CE. Though redating the document from 1912 to a single year roughly 2000 years earlier might be considered remarkable by modern standards, a date of 60 CE nevertheless remains in agreement with present-day estimates of the middle of the 1st century CE. The evidence supplied by these four passages does not give us anything like a clear date, and the most we can say is that the book may have been written – according to the evidence – between A.D. 95 and 130. 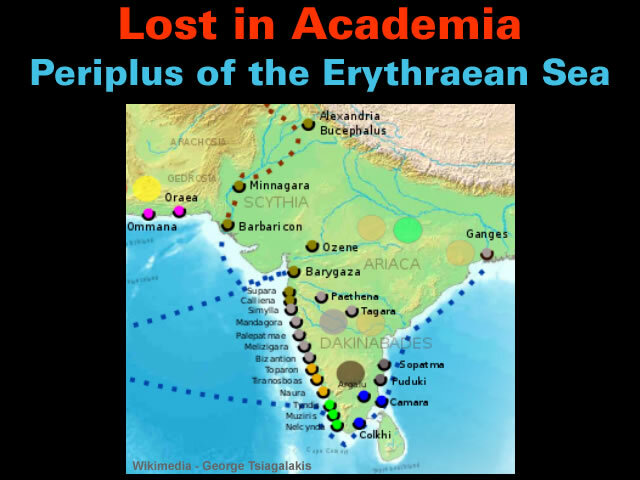 The Periplus of the Erythraean Sea provides a spellbinding Lost in Academia experience as the mainstream attempts to locate these ancient ports on a 20th century map of India. The unthinkable alternative is to locate these ancient ports on a map of a similar age. The Geography, also known by its Latin names as the Geographia and the Cosmographia, is a gazetteer, an atlas, and a treatise on cartography, compiling the geographical knowledge of the 2nd-century Roman Empire. Clearly, any attempt to locate these ancient ports a modern map will be problematical. There is nothing which can enable us to affign any one of thefe names to a modern reprefentative. I have offered a conjecture in the Commentary, that Meli-Zeigara may be Zyghur, and Palai-Patma (the old or great city) Dunda Rajahpoor; but it is mere conjecture. They muft be on the pirate coaft and not in Guzerat, where D’Anville places them, becaufe they are below Kalliena, which he acknowledges to be near Bombay. They are all mentioned by Ptolemy, who writes Balipatma (or the city of the god Bali) for Palai-Patma. Mandagora has the termination ghur, (a fort,) or oor, (a city,) which is ftill a native ufage. The Machiavellian beauty of having Taprobane surreptitiously Lost in Academia is that it allows the mainstream to have a field-day discrediting Ptolemy for his erroneous co-ordinates, untraceable locations and appallingly inconvenient maps of India. But I am perfuaded that both Ptolemy and the Periplus agree in the general divifion and relation of Larike and Ariake, and differ only in the appellations they have adopted. The names of places, rivers, mountains, and provinces, in Ptolemy, are as aftonishing as his errors in pofition, longitude, and latitude, are manifeft. The principles he here laid down have proved of permanent validity, and are still practically applied in the art of map-construction, but his determinations of the position of places, owing to the paucity and imperfection of the astronomical observations on which, in combination with the existing measurements of terrestrial distances his conclusions were based, are all, with very few exceptions, incorrect. There is perhaps no part of the contents which has received more attention from scholars than the chapters relating to India, where the tables abound to a surprising extent with names which are found nowhere else in classical literature, and which were doubtless obtained directly from Indian sources, rather than from reports of travellers or traders who had visited the country. On glancing over these names one cannot fail to remark how very few of them have any but the most distant resemblance to the indigenous names which they must have been intended to represent. The information possessed by the Greeks in the time of Eratosthenes concerning the peninsula of India, and still more concerning Taprobane itself, was so utterly vague and erroneous impossible to regard this assumption as more than a lucky guess, founded on the belief that Taprobane was the most southerly portion of Asia, and perhaps confirmed by the notion (utterly unfounded in itself) of that great island extending from east to west towards the Land of Cinnamon. 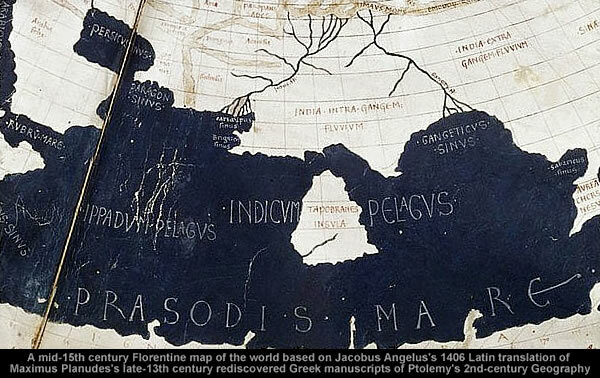 Ironically, the Indian ports listed in the Periplus of the Erythraean Sea can be sensibly sequenced as a coastal voyage on Ptolemy’s map of India. Evidently, Ptolemy and the Periplus of the Erythraean Sea were more successful at locating ports along the Indus river [in North West India] than modern academics. Alexandria Bucephalous, or Alexandria Bucephalus or Alexandria Bucephala or Bucephala or Bucephalia, was a city founded by Alexander the Great in memory of his beloved horse Bucephalus. There were two cities named Minnagara, one on Indus River delta near Karachi and the other at Narmada River delta near modern Bharuch. Minnagara may be identical with the Manjábarí of the Arab geographers. Alternatively, “Nagara” being the Sanskrit word for “town”, the city itself may have been called “Min”, a name found in Isidorus of Charax as a Scythian city in Sakastan (Lassen). Barbarikon was the name of a sea port near the modern-day city of Karachi, Sindh, Pakistan, important in the Hellenistic era in Indian Ocean trade. However, academia claims to have successively located [at least] two places in India. Bharuch, formerly known as Broach, is a city at the mouth of the river Narmada in Gujarat in western India. It was known to the Greeks and Romans as Barygaza, and probably had a settlement of Greek traders. As one southern terminus of the Kamboja-Dvaravati Route, it is mentioned extensively as a major trading partner of the Roman world, in the 1st century Periplus of the Erythraean Sea. An ancient city situated on the eastern bank of the Kshipra River, Ujjain was the most prominent city on the Malwa plateau of central India for much of its history. Ujjain’s co-ordinates are 23°10′N 75°46′E with an average elevation of 494 m (1620 ft). The intriguing aspect of these two locations from the Periplus of the Erythraean Sea is that they are near the suture zone that joins Taprobane to India. In structural geology, a suture is a joining together along a major fault zone, of separate terranes, tectonic units that have different plate tectonic, metamorphic and paleogeographic histories. The suture is often represented on the surface by an orogen or mountain range. Of the two loctions, it’s Ozene [aka Ujjain aka Ougein] that presents a real challenge to the mainstream because modern day Ujjain is 330 kilometres inland and 494 metres above sea level. Therefore, it comes as no surprise, that Wikipedia’s entry for Ozene [aka Ujjain aka Ougein] forgets to mention that it’s referenced in the Periplus of the Erythraean Sea. And it’s par for the course that the Wikipedia entry for the Periplus of the Erythraean Sea forgets to mention that ancient Ozene is buried “fifteen feet or more” in the ground. The ruins of the ancient Ozene are ftill difcoverable, at a mile diftance for Ougein ; and coins and bricks are ftill dug up there, at the depth of fifteen feet or more. The ancient walled city of Ujjain was located around the Garh Kalika hill on the bank of river Kshipra, in the present-day suburban areas of the Ujjain city. This city covered an irregular pentagonal area of 0.875 km2. It was surrounded by a 12 m high mud rampart. The archaeological investigations have also indicated the presence of a 45 m wide and 6.6 m deep moat around the city. But studying this dubious document further is futile self-flagellation because the English texts are inconsistent [and arbitrary] speculations that are quintessentially Lost in Academia. The author of the Periplus has strangely disfigured this passage, or a similar one, from some other author. He says, that wool (I suppose some particular kind of it), and silk, were brought by land from China to Baroche, through Bactra, or Balkk; and then, down the Ganges, to Limyrica. He certainly meant, that the goods were sent, part to the west, through Balkh, and part to Palibothra; and from the latter they were carried down the Ganges, and by sea, to Limyrica: this was, I suppose, the original meaning. Very unfortunately the age of the author of the Periplus of The Erythraean Sea, a work, which, for approved accuracy of geographical, nautical, and commercial, information, ftands unrivaled by any production of antiquity which has come down to our times, cannot be fettled fo near as, whether he lived about the middle of the firft, or the middle of the fecond, century. In this uncertainty I here introduce an extract of the commercial information contained in this pretious relique. Under the name of the Erythraaean Fea the author comprehends that part of the Ocean, which is between Africa and India, and apparently alfo the Gulf of Bengal. He obferves, that the unexplored ocean extends to the Southward till it joins the Atlantic ; a moft capital and important piece of geographical and commercial knowlege, which had lain concealed from almoft the whole world from the age of Necos king of Egypt (about fix hundred years before the Chriftian tera) till the re-difcovery of the Cape of Good Hope by the Portuguefe : for Herodotus, though he recorded the circumnavigation of Africa by the Phoenicians in the reign of Necos, appears not to have believed it himfelf : and no other Greek or Roman writer, to the beft of my knowlege, unlefs the Mauritanian prince Juba may be reckoned among them, had the fmalleft idea of the true geography of the fouth part of Africa, though feverals of them have fabulous ftories of wonderful adventures on fome of its coafts. Gallery | This entry was posted in Books, Catastrophism, History. Bookmark the permalink.